reichelt have sponsored a challenge to build a computer for £300. With a budget of only £300 I have to source the best bits of computer equipment for a main central processor unit (CPU) to build the most competent computer I can. In part four, we look at the Memory. The Kingston HyperX FURY schwarz Kit 8GB, DDR3-1333 costing £54.41 incl. VAT. 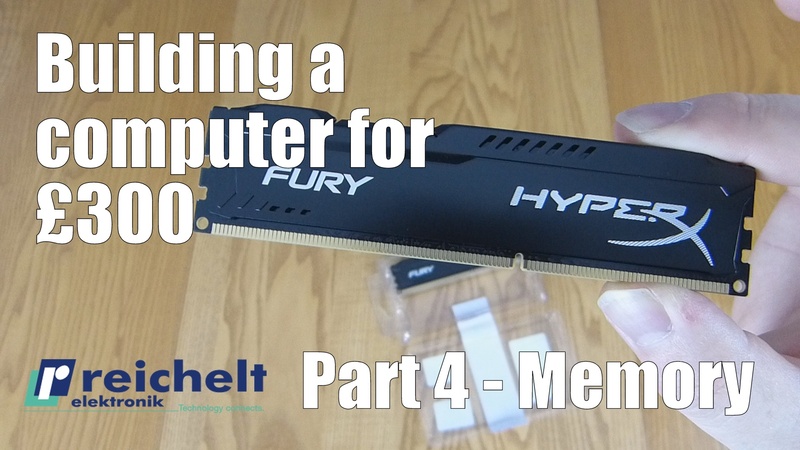 Great memory, that takes the pain out of picking the correct clock speed for your motherboard. This stuff overclocks itself to match up with the frequency of the board. Score with the HyperX FURY. Fury recognises its host platform automatically and overclocked and automatically overclocks to the highest specified frequency of up to 1866 MHz1. This gives you power for your next punch and lets even beginners get up to speed. The FURY’s asymmetric heat sink makes it stand out from standard designs. It is available in the colours black, blue, red and, for the first time in HyperX history, white with a black PCB. Now, you can show off your stylish equipment at a really reasonable price. Fury is 100% tested, LAN-capable and comes with a lifetime warranty and free technical support. Hit the subscribe button as tomorrow we will be looking at the main board into which this processor slots. Check out reichelt.co.uk, an online electronics retailer…many products up to 20% cheaper than elsewhere in the UK!